Everyone wants sparkling and refreshing pool waters. Whether to entertain beside, for a refreshing dip, or for regular exercise, your own backyard paradise can help you alleviate stress, engage in rewarding conversations with family and friends, and find the time necessary to nurture your own mind and body. When it comes to keeping your pool primed and ready for all of these important roles, combating organic matter is central to maintaining a crystal clear pool. When we say “organic matter,” what we are referring to is a number of items combined into this umbrella category. From soil to leaves, pollen to debris, oils from swimmer’s bodies to insects, all miscellaneous foreign matter that makes its way into your waters can act as a detriment to the health of your pool. • Skim out any leaves and other materials that float on the surface of your water. • Regularly check your baskets to prevent build-up, clogging, and ensure proper functioning of your equipment. 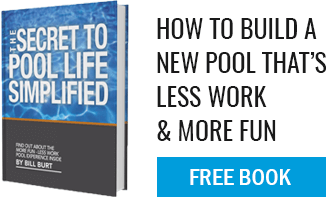 • Brush any excess dirt towards your pool’s central drain. Watch for areas like steps that are difficult for your vacuum to navigate. • Vacuum to remove any sitting organic matter. Note, leaves and other items can stain your pool if left to decay on their own in your water. This can be a costly issue to resolve and can leave eyesores on your beautiful pool! • Run your systems for circulation and proper distribution of chemicals! • Testing your water chemistry and adjusting as necessary is also a key component to creating safe and swimmable waters.